The UAE clinical laboratory services market exhibits a fragmented vendor landscape. The top three players, constituting National Reference Laboratory, Abbott, and Anglo Arabian Healthcare, however had a stronger presence and held around 44% of the UAE clinical laboratory services market in 2016. Currently the market players are focusing on expansion strategies to make their foothold stronger, finds Transparency Market Research (TMR) in a new study. Companies such as National Reference Laboratory are achieving the same by setting up research laboratories across various Gulf nations. Also the companies have considerable focus on product innovation. For instance, Abbott is focusing on next generation laboratory automation solutions to help laboratories meet the rising demand in tests. Given the scenario, the demand for clinical laboratory services is expected to scale higher in the coming years. As per TMR, between 2017 and 2025, expansion demonstrated by the market will get stoked at 5.4% CAGR. At this pace, the market will value at US$2.6 bn by the end of 2025, from US$1.6 bn in 2016. Based on service provider, the market was dominated by clinic-based laboratories, which held over 38% share in 2016. In terms of test, the clinical chemistry segment held the leading share of 37.9% in the UAE clinical laboratory services market in 2016. The rising incidence of chronic ailments and infectious diseases is the chief driver of the UAE clinical laboratory services market. In the last few years, infectious diseases and chronic ailments have increasingly spread across the Middle East, which has in turn fuelled the demand effective clinical diagnosis in the region. Also the rising aging population have stoked the demand for clinical laboratory services. With age people become more vulnerable to diseases and infection, which is why the demand for clinical laboratory services is considerably high in this demography. In the last two decades, the GCC countries have demonstrated robust economic growth. 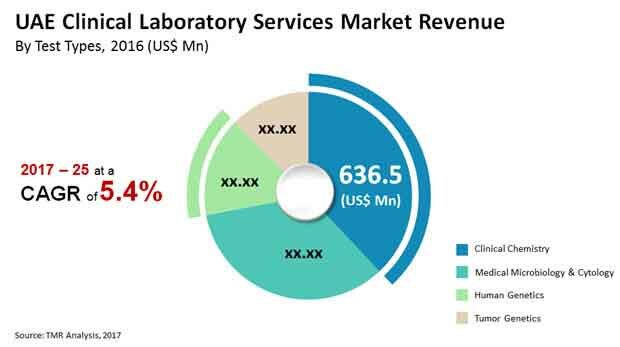 This coupled with the expanding medical tourism, government initiatives aiming at development of the healthcare infrastructure, and rising awareness of infectious diseases, the clinical laboratory services market will record accelerated pace of gains in the UAE. Also the spurring investment in the healthcare sector will enable the market showcase strong growth in the coming years. Considering these improvements, the UAE presents an environment conducive to novel product launches. Hence, in the last few years the country gained traction from several leading international manufacturers of medical devices. For instance, leading pharmaceutical companies such as Abbott Laboratories, Inc., expanded their operations across the UAE, giving much impetus to the clinical laboratory services market. On the downside, the UAE clinical laboratory services market is restrained by the shortage of medical personnel. “Despite recent medical developments, the market is reeling under shortage of medical personnel in Gulf countries, compared to other nations in the West,” said a lead TMR analyst. This has put increasing pressure on the government for provision of improved healthcare and clinical laboratory services. Nevertheless, the UAE has high unmet medical needs and large patient pool, which will continue creating lucrative opportunities for the clinical laboratory services market. Besides this, the market is also expected to gain impetus, as healthcare reforms gain pace across GCC nations.